Inventories of distillate fuel, a category that includes both diesel and home heating oil, were 117.7 million barrels at the end of June, the lowest end-of-June level since 2004. 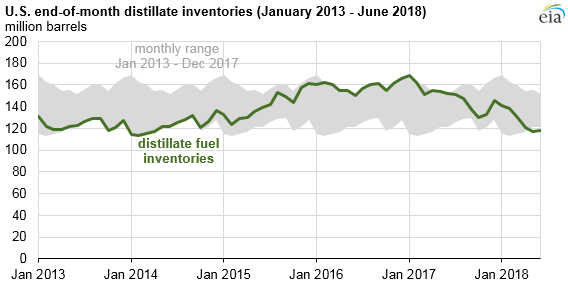 Distillate inventories have generally been lower than the previous five-year (2013–2017) average throughout 2018. Relatively low inventory levels reflect growth in distillate consumption during 2018 that has not been fully offset by increased domestic refinery production or by lower net exports of distillate. EIA estimates that U.S. consumption of distillate fuel averaged 4.12 million barrels per day (b/d) during the first half of 2018, which was 190,000 b/d (5%) higher than in the same period of 2017. This increase is largely attributable to an increase in trucking activity, which is the leading use of diesel fuel. Demand for trucking services tends to be closely correlated to economic growth and industrial activity, both of which have been higher in the first half of 2018 compared with the first half of 2017. Cold January temperatures in the Northeast also led to more heating oil consumption. In January 2018, temperatures in the Middle Atlantic and New England—regions with relatively high shares of homes using heating oil—were 25% and 21% colder, respectively, than in January 2017. On the supply side, EIA estimates that refinery production of distillate fuel in in the United States averaged 5.0 million b/d in first six months of 2018, which was 30,000 b/d higher (1%) than in the same period of 2017. Net exports (gross exports minus gross imports) of distillate fuel averaged 1.1 million b/d in the first half of the year, which was 80,000 b/d (7%) lower than in the first half of last year. The lower net exports largely reflected an increase in imports during the first quarter of the year to meet increased demand for home heating oil. The increase in domestic distillate consumption relative to supply has contributed to diesel prices rising by more than crude oil prices (the main input cost in distillate production) over the past year. The spot price of Brent crude oil averaged $71 per barrel (b) in the first half of 2018, an increase of $19/b, or 46 cents/gallon from the first half of 2018. The retail price of diesel averaged $3.11/gallon from January through June 2018, up 55 cents/gallon from January through June 2017.